A new model, featuring unreleased solutions for the MV Marine brand, is ready for launch. The official presentation will be in December at the Paris Boat Show. 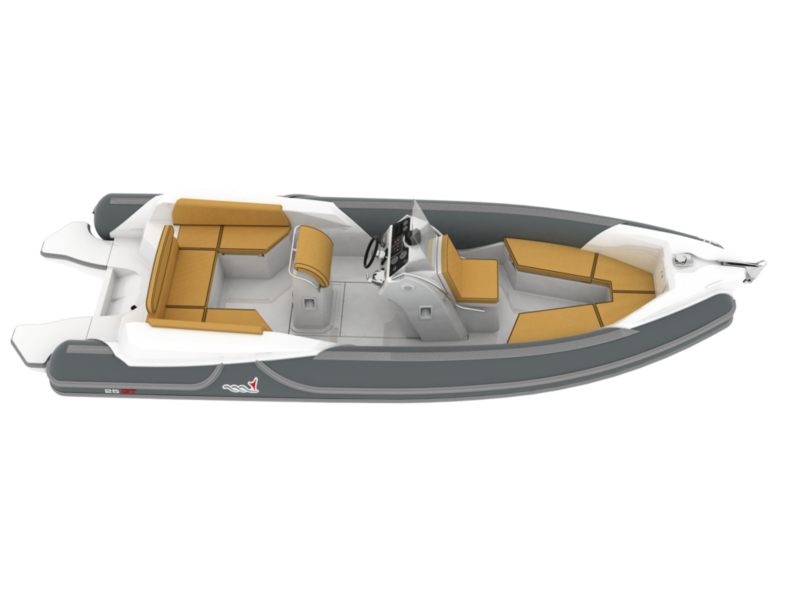 The new 7meter inflatable boat line is definitely sporty, but in the context it still remains elegant and sober, therefore the name of 25 GT “gran turismo”. The hull has the same water lines as the production models, always appreciated for the comfort of navigation, for low running costs and to make the boat dry even in rough sea. The real revolution lies on the deck as it lacks, just like in the other models, the large bow and stern sundecks. 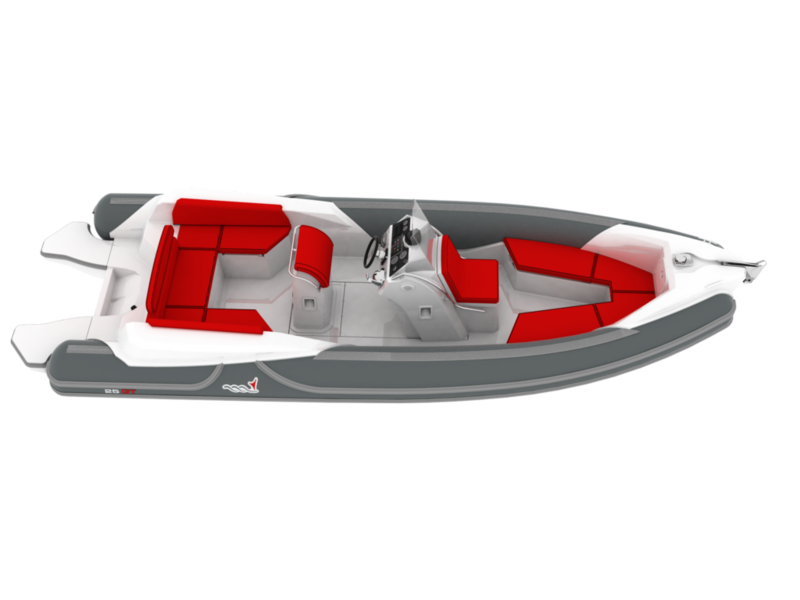 In the 25 GT, there are two U-shaped sofas on the bow and aft, for large seating areas that can be turned into sundecks. With this solution you can have the table in both the bow and stern couch. The console is one of the strongest features of this model; it has a sophisticated design, with a harmonious and slim line towards the pilot, allowing a perfect view of the onboard tools, the same is completed with a seat, where the onboard fridge is located. For the pilot there is a comfortable ridge rest, which also acts as a lock. In the aft U-shaped sofa there are many seats, with underneath comfortable lockers, with a special table so to get a wide living area for life on board. Another interesting solution, is the dedicated passage for descent into the water, without having to overcome the couch to reach the footpaths of the wet. 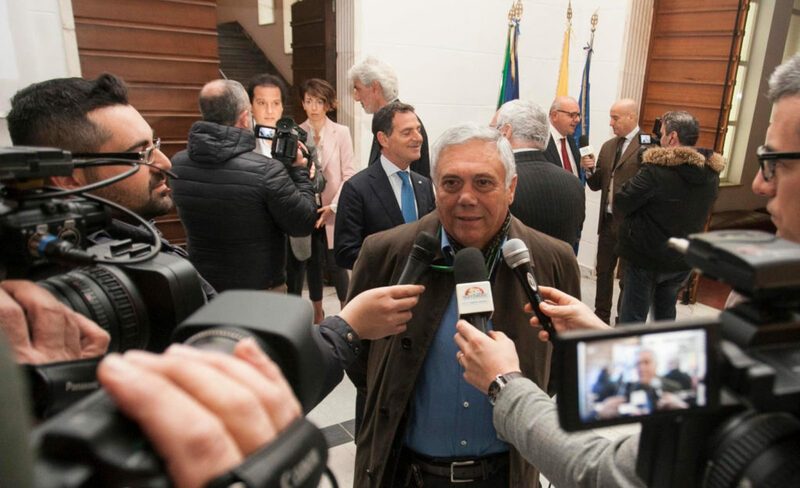 “MV 25 Gran Turismo, as well as the latest models, is designed to be modular, with the possibility of having more solutions on the deck, in order to meet the needs of sailors and compete on a wider market, which is not only within the Mediterranean – explains Mr. Vincenzo Nappo, founder of MV Marine – this unit, even though it has wide space on board, is approved for only 7 meters, to fully meet the needs of the French market. 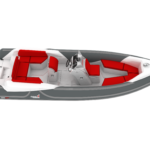 Therefore, a more aggressive line that follows the design of the Mito series, the point of reference in the segment of the Rib, at a different setting of the deck, in terms of space and interior, but at the same time more convenient to ensure the comfort for long trips, from coast to coast.“. The construction technology is the one recognized by MV Marine, where the quality of the materials used, the innovative construction techniques, “infusion, sandwich, RTM light”, the degree of finishing, are the essence of every single element with which a MV boat is made. MV 25 GT follows Italian style and elegance and will be officially presented in France, in Paris, at the Boat Show, taking place from December 2 to 10, where the MV Marine yard will be present with its own booth at Hall 4, stand C22. 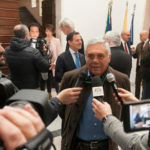 “The Cannes Film Festival and the Genoa Boat Show have guaranteed good business meetings and contracts – continues Nappo – we are getting good responses from the foreign market, from America to the South East Mediterranean, and we are intensifying the commercial presence in northern Europe, where our models are highly appreciated. No coincidence that in January we will be present again at the boat show in Dusseldorf and will continue our tour in Spain, in between a boat launch and the other. “. 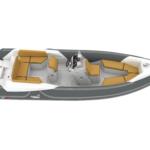 At the Paris Boat Show will be exhibited, in addition to the 25 GT, the 650 Comfort with a different setting of the cockpit, the 800 Comfort and to complete the Mito 31 with stern nets, according to the latest trends, all with new colors. In Düsseldorf will be exhibited the new 25 GT and the Mito 31.